The arboriculture industry in North America has overcome a number of major industry challenges. Many of these tests have been presented by Mother Nature. The year 1930 would begin the decimation of over 75% of the nation’s elms by Dutch elm disease, only to be outdone at the turn of this century by the emerald ash borer infestation which cost over $10 billion in damage and the destruction of over 17 million ash trees. Today, the devastating wildfires in the western portion of the country will require salvage logging and forest replanting operations, while repeated violent storm activity across the land is keeping tree cutters busy in urban areas. Demanding times in the arborist industry have traditionally served to increase the number of skilled arborists and the profits of tree cutting businesses. At the same time, manufacturers attempt to beef up new equipment models or add new features to the same tree cutting equipment. This article aims to have a discussion on some of the past and current tree cutting practices and present new machinery that can offer tree dismantling and removal businesses a ten-fold increase in productivity and a reliable method to get jobs done without a loss in profit margin. Imagine, one person, getting more work done than an entire crew, and in less time. While there will always be a continuing need for skilled and trained arborists, our goal is to provide the tree care community with a powerful innovative new machine that provides this industry with safety, comfort and efficiency. Tree cutting can be a dangerous and labor-intensive job. With a limited crew of workers, a business is limited in the number of contracts they can effectively take on at one time. Additionally, bidding on large projects without adequate manpower and equipment takes its toll in time, effort, and lost profits. Early History- The main tools used to trim and fell trees in the early days included hand saws, ropes, pole runners, and a 10-mule team for transport. The tough and brawny men would become giants of legend, known as ‘lumberjacks’. 1944 - The cherry picker lift is invented by Jay Eitel in the community now called ‘The Silicon Valley’. The hydraulic-powered bucket would extend under manual operation by a second worker. An accurate picture of the state of the industry is also a challenge to determining the health of the industry. The tree care profession includes not only tree cutters, but also workers employed in the pruning of branches, removal of dead sections, stump grinding and removal, tree transplanting, fertilizing new and established trees, and the administrative workers employed by tree care services. Today, the bulk of the projects completed by arborists and tree care workers include clearing right-of-ways and land developments for new construction, the removal of fallen and damaged trees following destructive storms, and the management of trees to prevent contact with utility power line dedicated space. In these environments, when you consider that many professional tree cutters are tasked with working in these oftentimes risky environments, it becomes clear that a new approach to tree care can help to transform the industry with more efficient operations, increased profits and better safety statistics. TCIA members employ over 100,000 people and represent about 2,400 businesses engaged in commercial tree care. Statistics released by the US Bureau of Labor Statistics (BLS) in 2016 estimate 40,680 arbor industry workers earned a mean hourly wage of $17.94. Through the years, advancements in personal safety equipment and increased governmental safety regulations have sought to overcome many of the challenges that workers face. 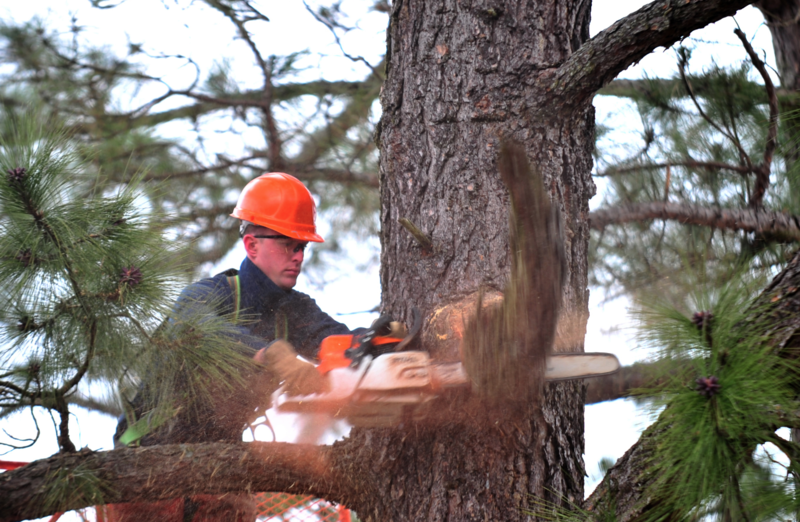 From the early days of the cross cut saw, the tree care industry has made many advances in equipment, techniques and technologies to meet these challenges. And while this is not to discount all the strides that have been made to increase worker safety and the continuing need for education, however, tree removal for utility line clearance, emergency storm response, and vegetation management still leads the nation in occupational safety hazards. Electrocutions, critical head injuries, falls, machine-related injuries (especially with wood-chippers), and being struck by falling objects continue to inflict workers and cause deadly results. Bucket trucks, aerial lifts, chainsaws, and specialized wood cutting tools have not overcome these challenges. As a matter of fact, the use of power tools near utility lines and the risk of a false sense of security a percentage of workers may experience on aerial lifts have only added to making this industry one of the most dangerous in the country. The truth is, today’s tree workers and tree removal procedures have not yet overcome many of the occupational safety issues, while at the same time the work is still labor-intensive and without remarkable offset in productivity, manpower, time, or costs. According to the US Bureau of Labor Statistics (BLS), an average of 200 tree-related fatal injuries occur every year due to hazardous objects and equipment like chainsaws or axes, falling from trees, and transportation incidents. In 2016, BLS Census of Fatal Occupational Injuries reported 84 tree trimmer/pruner deaths due to event or exposure and 41 falls, trips, or slips. What would your tree removal business look like if you could drastically reduce work-related risks and the associated legal issues and fines that accompany workplace accidents and property damage? The future of the tree care industry is here - as SENNEBOGEN introduces its line of tree handling equipment that dramatically improves safety and reduces the size of on-site crews – all while simultaneously cutting and handling trees and branches in the most rugged environments and obstruction-filled landscapes. 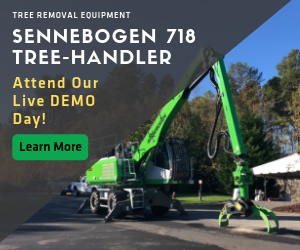 The SENNEBOGEN 718 series is a custom-engineered versatile tree care handler that integrates multiple tree cutting production tasks into one machine – requiring one operator. Consider a saw head and material handler on one machine that precuts and safely stacks timber in a fraction of the time over conventional methods. When mated with a self-powered chipper, your operations become automated and your tree removal process will outpace the competition 10 to 1. The versatile 718 series is purpose-built specifically for the tree care industry and is suitable for urban applications, including utility line management, maintaining road embankments, clearing land for residential or commercial construction, large-scale municipal projects such as parks, and widespread storm damage remediation. For an industry that still operates to a large extent by man power and hand-held power tools – all while workers are oftentimes exposed to the most risky of situations – the SENNEBOGEN 718 is revolutionary. Watch the SENNEBOGEN 718 E-Series in action on the YouTube channel or visit SENNEBOGEN North America online.